Learning the history and practice of makgeolli making, and even getting our hands dirty by making a batch ourselves, is an awesome, very culturally unique way for people from various walks of life, communities and cultures to get together to express a mutual creative passion. Makgeolli is a deep part of Busan’s history. This fermented rice wine’s origins trace back to the Joseon Dynasty era when people began to brew it at Geumjeongsanseong Fortress, located 800 meters up on the top of Mt. Geumjeong here in Busan. The lightly-carbonated, mildly-alcoholic beverage, with its milky, pleasant taste, has been passed down for generations. Making yeast-fermented liquor can be a cumbersome task because the finished product is very much influenced by its environment. This has not stopped producers such as Geumjeongsanseong Fortress from making makgeolli. Geumjeongsanseong Fortress, as well as Yeonyojae in Munhyeon-dong (neighborhood), are two locations that provide people with hands-on makgeolli making programs in Busan. 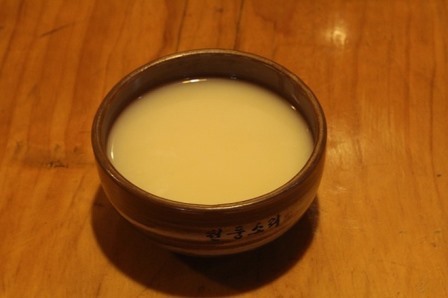 Geumjeongsanseong makgeolli has a strong flavor, pleasant scent and a clean aftertaste. They have honed their makgeolli making skills over generations, sticking to the traditional methods that have continued to make it a popular beverage that can be enjoyed on its own or paired with food. Quality yeast is kneaded underfoot before being stored in a temperature and moisture-controlled environment until it is time to be used in the creation of the final product. Geumjeongsanseong Fortress currently runs a program for study and experience. The one-hour session includes the history of makgeolli, the makgeolli brewing process, tours of the brewery and yeast room and makgeolli sampling. Yeast kneading and makgeolli making will be added to the program in November with fees expected to be 10,000 to 20,000 won per person. Yeonyojae, located near the Busan International Finance Center, is also well-known as a makgeolli school that provides classes on the history and meaning of Korean makgeolli. Rice is steamed and cooled before yeast powder and water are added to mature it. Then, residues are drained and the remaining alcohol is fermented to produce the makgeolli. At Yeongyojae, sample a variety of makgeolli from across the nation and try to make your own. There are other experiential programs at Yeonyojae, as well, including making fermented vinegar, makgeolli mask packs and soaps. Information: For the Geumjeongsanseong Fortress program, send inquiries to xhtkswn@nate.com or call their manager at 051-517-0202 (not fluent in English). For Yeonyojae, call 051-636-9355 or message them on Facebook at facebook.com/yeonyojae.